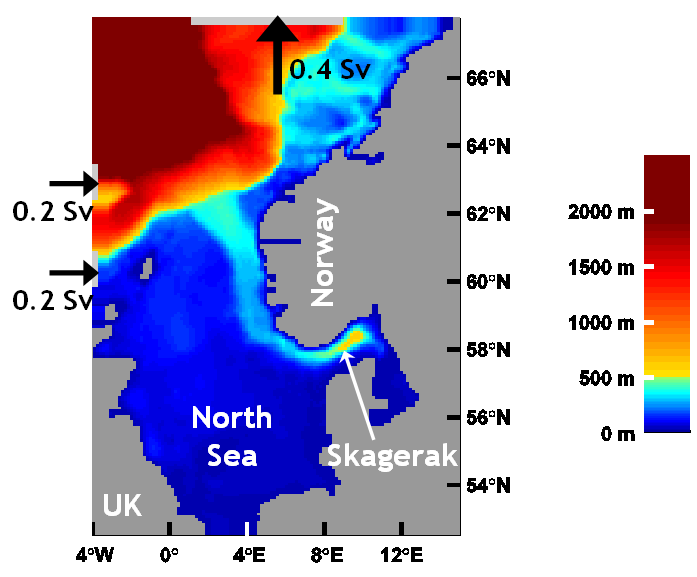 To study the deterministic vs. non-deterministic nature of meanders and eddies in the ocean, in the region of the continental shelf and shelf slope off Norway, in order to quantify errors in non-assimilative ocean circulation models, and to identify regions that are dominantly deterministic. Bottom topography of the simulation domain. A barotropic inflow of 0.4 Sv of warm, salty Atlantic water is prescribed at two ports on the western boundary, and a corresponding outflow is prescribed on the Northern boundary. The hydrography is relaxed towards a monthly climatology in zones along the open boundaries, and in the Kattegat. Despite the popularity of ensemble simulations for medium-range and long-range forecasts in meteorology, similar activities are rather sparse in the ocean modeling community. The abundance of mesoscale activity (such as eddies) off the Norwegian coast has been thoroughly documented. In this project, the degree of determinism of the ocean circulation in various coastal and shelf slope regions will be quantified by means of multi-year wind-driven ensemble simulations. Then, using objective analysis techniques, we are in a position to gain and loose faith in various forecasted circulation features in non-assimilative ocean circulation simulations. Another issue that will be studied is relations between the surface circulation and the water masses below, and the associated variability. Ensemble simulations as a tool for ocean circulation forecasts and studies is expected to gain in popularity in the near future, since the prospected speed and memory capacity of high performance computers will allow for semi-global/global eddy resolving simulations within the next few years. For a number of reasons, the time is therefore ripe for a study such as this investigation. The Ensemble project ended formally when the project end report was submitted and accepted in 2004. The web pages are kept available since results remain relevant for scientific and operational aspects of ocean modeling.